Browse our video gallery to see Dr Rita Rakus in the media, her signature lip treatments and overviews about our award-winning treatments. 'The Professional Interview' - Nicky Hambleton Jones interviews Dr Rita Rakus. Celebrity Fit Club contestant Carole Malone talks about her Thermage treatment. Dr Rita Rakus interview on The Morning Show on Dubai's MBC. 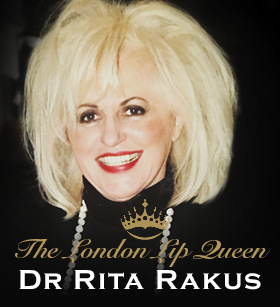 ITV special interview with Dr Rita Rakus, the London Lip Queen. Dr Rita Rakus gives a patient a lip enhancement treatment. Learn more about the revolutionary BTL EMsculpt treatment at the Dr Rita Rakus Clinic. Discover 'The Science Behind Coolsculpting' - the fat freezing treatment. TV clips from the USA featuring the Thermage treatment. TV Show discussing benefits of Pelleve treatment. Dr Rakus & Mr Golchin explain more about the exclusive Angel Lift, using a unique combination of treatments. The ENVY Facial with Sophie Anderton at the Dr Rita Rakus Clinic. Hydrafacial treatment, as recommended by Baroness Karren Brady CBE. Video about the laser treatment, Fraxel. Learn more about Fraxel from patient's who have had the treatment. Learn more about restylane and how it works.